An expensive bulldog claimed without authorization last week from a North County kennel, where the puppy had been brought after getting lost, was reunited with his owners Thursday. 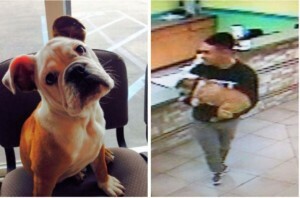 The man who took the 5-month-old English bulldog, named Schroeder, from the boarding center in the 900 block of West San Marcos Boulevard returned him to his rightful home just down the block this afternoon, according to sheriff’s officials. A good Samaritan found brown-and-white pup wandering unsupervised on the evening of March 19 and brought him to the dog-care operation. About 45 minutes later, a man showed up and claimed to be a friend of Schroeder’s owners sent pick him up. An employee asked him to describe the bulldog, and when he successfully did so, turned the animal over to him. Ensuing publicity about the dog-napping apparently prompted the responsible party to return the $4,000 puppy, according to a statement from the Sheriff’s Department. A veterinarian looked over the animal and gave him a clean bill of health. It was unclear if the man who absconded with Schroeder might face any charges. His name was not released. The case remained under investigation, authorities said.